Situated in the Bojanala region of the North West Province, the 'Las Vegas of South Africa' is one of the largest entertainment centres for adults in the world, with casinos, golf courses, live shows, and the architectural wonder of the Lost City. The vast resort complex is one of South Africa's top attractions for gambling, entertainment, and opulence, a luxury theme park for adults that was the multimillion dollar dream of South African entrepreneur Sol Kerzner. The Lost City, with its African theme of life-size animals, has at its centre a luxurious palace decorated with mosaics, frescoes, palm fronds, and elephant tusks. Surrounding it are lakes, forests, and a tropical beach. There are a variety of water sports and The Valley of the Waves, the most advanced waterpark in the country, has among other things a wave machine capable of generating almost seven-foot (2m) waves. The waterpark is fabulous fun for the whole family with numerous slides and a wonderful Lazy River. 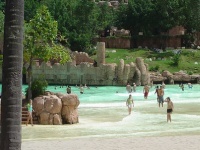 Buying a day pass for the Lost City waterpark allows visitors to explore the extensive grounds and access the casino. There are a number of Sun International hotels on the property and the resort complex also borders on the Pilanesberg National Park, home to the Big Five and a popular game-viewing destination.